Single stage, horizontal, seperable body, radial impeller, double suction pmumps. The back-to-back design of the double entry radial impellers eliminates all thrust. Pump flanges are designed according to ANSI/ASME B16.1 Class 250 .The suction and discharge flages are alon the same axis. Shaft sealing is provided with soft packing. 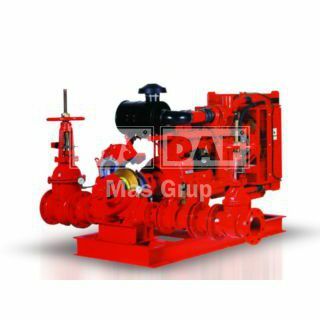 Double suction pumps have the advantage of low NPSH features. The pump and electric motors are connected to the chassis by means of flexible. Diesel motors can also be used. In standard manufacture, the impeller, the body abrasion gasket and the gland are bronze while the casing is of stainless steel.